Sometimes I think that TobyMac isn’t even human. Maybe he’s an alien or a robot? How else could he accomplish so much in the CCM industry (multiple Grammy and Dove awards, plenty of number 1 singles, and tons more relatable and inspiring melodies) and also still stay so grounded in a music market that is becoming more and more cutthroat; while at the same time having a constant sound and relevant material for people of all ages and all belief systems? On a more serious note, TobyMac is only 54, and with many recognisable songs such as “City On Our Knees”, “Made To Love”, “Lose My Soul”, “Tonight”, “Me Without You”, “Get Back Up”, “Speak Life”, “Love Broke Thru”, “Feel It”, “Beyond Me”, “Move (Keep Walkin’)”, “Burn For You”, “Gone”, “Atmosphere”, “Everything” and “i just need u.”; the pop/rap extraordinaire who is also 1/3 of the highly respected and popular 90’s band dc Talk, is back with 2 newly recorded versions of his latest single “Scars”. With the original recording present on The Elements (of which we reviewed here! ); this left-field keys driven pop number has me very excited for whatever God has planned for Toby next. 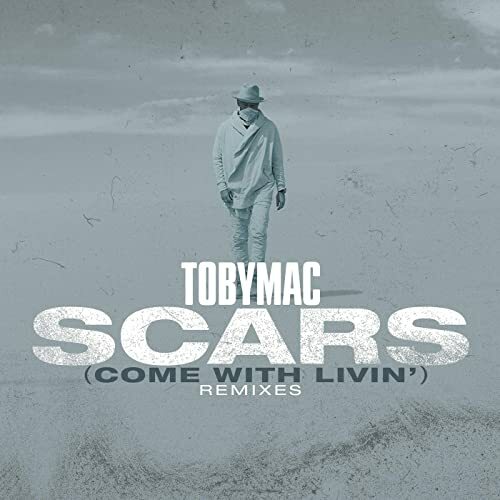 With each remix being very unique and each of the guest vocalists (Sarah Reeves and TERRIAN) singing together with Toby in perfect harmony; “Scars” is a reminder that Toby still has the ‘it’ factor, and also reminds us why he’ll still be a force to be reckoned with in many, many more years! The third single from The Elements; I didn’t really connect with the original studio version. That’s not to say the song wasn’t good, but amongst album standouts like “Starts With Me”, “Everything”, “I Just Need U”, “The Elements”, “See The Light” and “Edge Of My Seat”, “Scars” kinda was lost in the shuffle. However these two remixes put the song firmly back into our minds, bringing forth a message that is timely and relevant- that life can bring us down and give us scars, however as a people and as a community of believers, we can band together and support each other through anything. Musically and stylistically these two remixes are quite different- but each melody is distinctly Toby- his own genre that cannot really be defined- and that’s definitely a good thing! Even though Toby has time and time again released plenty of high quality albums- with The Elements, This Is Not A Test, Eye On It, Tonight, and Portable Sounds being the projects that have made it big for him – not to mention the live recordings of Alive & Transported and Hits Deep Live as well! (so basically his discography post-Welcome To Diverse City); calls for TobyMac to stop doing solo music and reunite formally with dc Talk remain, and become louder by the day. Especially since dc talk reunited for their cruise in 2017, and will again in just over a couple of months- however as of this point, I believe Toby is doing what God has called him to do, and right now that’s solo music. In fact, I reckon Toby will keep doing music for the foreseeable future, and maybe longer. Musicians and artists do not retire, as each person still has much more to say; but rather they keep going until they feel and believe that they have said enough and don’t need to say anything else. For Toby though, in 2019; I reckon he’s got so much more to say. These two remixes of “Scars” is proof of that- and whenever Toby drops his next album (2020 or 2021? ), I know it will be big- and even now I have high hopes for it, even if none of the songs are written yet! Trust me- listen to The Elements, and tell me you’re not impressed and that Toby’s best days are behind him! Well done Toby- I can’t wait to hear more of what God is doing in your life.